President Andrew Jackson 1835 signed check. Drawn on the bank of the metropolis, Washington D.C. and dated November 4th, 1835. Made payable to J.D. Woodsedes for $10.00. The signature is beautiful and unaffected by the cancellation. The check has some very minor imperfections but is an extremely nice example of a Jackson check from his presidential days. The check comes from the Marshall b. Coyne collection. Jackson's presidency defined itself in two central episodes: the nullification crisis and the "Bank War." Jackson took office amid mounting sectional acrimony over the "American System" program of fostering economic development through transportation subsidies and through protective tariffs on imports to aid American manufacturers. Many Southerners believed these policies promoted Northern growth at their expense. 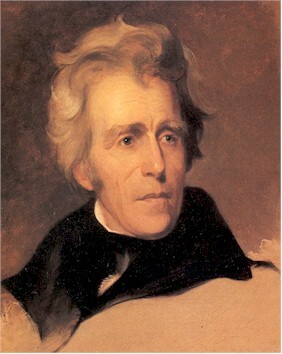 Jackson curbed the American System by vetoing road and canal bills beginning with the Maysville Road in 1830. However, in 1832 the state of South Carolina declared the existing tariff unconstitutional, null and void. The state took steps to block tariff collections within its borders. Though he favored a lower tariff, Jackson acted quickly to uphold federal supremacy -- by force, if necessary. In a ringing proclamation, he declared the Union indivisible and branded nullification as treason. Congress reduced the tariff in 1833, defusing the crisis. When it comes to early presidential collecting ONLY invest in historical Signed DOCUMENTS. NEVER buy a clipped signature of ANY President, particularly on Ebay were nearly 100% are forgeries. Other then the Presidential Check collection that sold for over $100,000 last year, this is the first Andrew Jackson check we have ever seen in 20 years of collecting. An exceptional RARE historical, museum-quality investment!